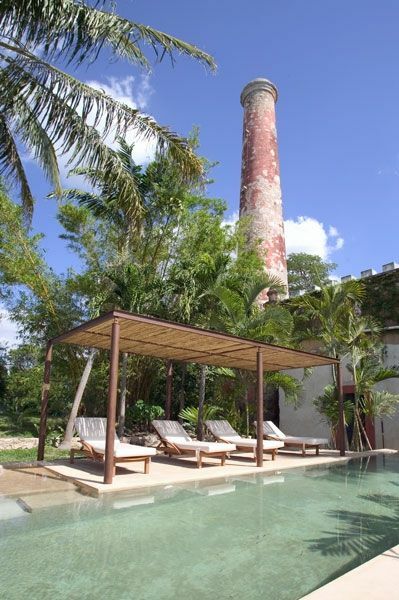 Tucked away on the lush grounds of Hacienda Sac Chich,Casa de Maquinas are 3 limestone buildings, a water tower and an 85 ft. chimney. Surrounded by palm filled gardens Casa de Maquinas consists of three 2000sq.ft. rectangular structures that date to 1850. CASA VIEJA houses the LIVING ROOM, 2 KING BEDROOMS, A LOFT BEDROOM AND 2 BATHROOMS AND THE COLONIAL KITCHEN. Opposite the Casa Vieja is the CASA NUEVA, where a dramatic central hallway is the entrance to 3 BEDROOMS and 3 BATHROOMS all with soaring 26’ ceilings and 13’ high doors. The large master has a sunken living area, and outside within a walled garden is a settee and plunge pool. Between these two buildings is an open-air living room and dining room, the LOGGIA. From the loggia climb a staircase to a ROOFTOP LOUNGE AND A STAR GAZING PLATFORM. Through a sea shell mosaic tunnel from the inner courtyard you find the 40 foot POOL AND regulation size BOCCE BALL COURT. NEED MORE BEDROOMS AND SPACE FOR A LARGER PARTY? RENT OUR BEAUTIFUL CASA SISAL # 286207 IN ADDITION TO THE HACIENDA. In addition to the loggia restoration and the new rooftop and Bocce Ball court we have a new hacienda entrance, driveway, bodega and a NEW 2100 SQ.FT. 2 BR, 2 BATH GUEST HOUSE. This house is called CASA SISAL and is VRBO # 286207. Although this home was designed in the modern aesthetic, the construction techniques and materials are the same as the hacienda. Surrounded by water lily filled reflecting ponds it was built in the henequen drying fields, adjacent to the hacienda. It is on 3 acres and is surrounded by a 10 foot historic hacienda wall. There is a modern kitchen, a dining area for 8-10 and a sunken living room with fireplace and a flat screen monitor for DVD viewing, and the house is wired for sound and i pod ready. There is a King in one bedroom and 2 Queens in the other. In the master bathroom the shower can open to an enclosed garden. There is a 30 ft edgeless pool with a playita of shallow water. The home is fully screened and air conditioned. This house also has access to the bocce ball court. It is a comfortable private enclave. A winding driveway from the main entrance leads to a private parking area. The house can be rented with the hacienda or separately. We live in California and travel to our hacienda any opportunity we get. Being frequent visitors to the Pacific beaches and colonial central Mexico since the 70's we read about the restored haciendas of the Yucatan. In 2001 we went on the first of many 'hacienda hopping' trips to the Yucatan. The grandeur, architectural scale, historical and economic relevance and process of restoration of these haciendas intrigued us and soon we were researching haciendas for sale on the internet. It wasn't until we rented a Hacienda for my 50th Birthday in 2003 that we experienced a sense of ownership while entertaining friends and family there. On that trip we toured hacienda Sac Chich, shortly thereafter made an offer and 5 months later it was ours. Sac Chich was the first and only hacienda we looked at for sale. We always knew we would someday have a home in Mexico, but always envisioned the Pacific coast or colonial interior. The Yucatan became the pure isolated uncomplicated Mexico that we remembered from travels 30 years ago. Being at Sac Chich is our opportunity to stop. We are surrounded by such tropical lushness and architectural grandness that sometimes you find yourself just sitting taking it all in. The simple sounds of the village children playing or a dog barking mingles with the bamboo swaying and clacking in the wind or the amazing birds that sing all day. We relax and enjoy the people we are with, swim, read a book,nap in a hammock, bird watch, play pool games, volleyball,frisbee,card games, charades,enjoy music, dine by candlelight. I had to laugh at the review we received from Heather from Colorado. Spontaneous dance parties are something we also enjoy! We are always hopping in the car to explore and discover. We go to Mayan ruins, cenotes to snorkel and swim, nearby haciendas to just see or relax and have lunch or dinner on their patios, go to the beach and eat seafood in Progresso or Celestun, visit Merida for tacos at our favorite taco stands, visit the early weekend market downtown Merida or enjoy one of the many cultural events that take place all week long there. Sometimes we just get in the car and drive and head down a road towards a village we have never been and stop in a tortilleria to get a stack of fresh tortillas. We always find smiling and curious Mayan people, giggling children and if we're lucky there is a tienda next door with very cold Mexican Coke in a glass bottle for us to enjoy! It is the simple pleasures of being at the hacienda that gives us the greatest joy! Located in Sac Chich, a rural Mayan village of 100 Mayans, you will be able to tap into the local culture. One mile down the street is Acanceh, the county center and the Mayan ruins of Acanceh. The house phone is a cellular phone. All calls made will be deducted from deposit. Indoor and covered outdoor living space in loggia. Also rooftop seating. Coffee is prepared in Bodums or coffee machine for larger groups. There is an oven and microwave, water cooler, stovetop, refrigerator and large sink. Dining table with 10 chairs in loggia for covered outdoor dining. Kitchen dining table can seat 10 also. Deck areas off pool and patios off of kitchen, master suite, a king suite and loggia building. 40 foot fresh water swimming pool with bamboo pergola, hammock and 4 chaise lounge. Pool is maintained daily. 1- 1,000 sq.ft. master suite w/King and private bath and patio w/plunge pool, 2 King and 1 Queen bedrooms all w/private baths, 1 King bedroom and loft bedroom with 1 Queen and 1 twin beds and shared bath in restored water tower. 2000 sq. ft covered loggia , 85 foot chimney, trampoline , 4 bikes on property for guest use. Lit Bocce Ball court, Volleyball, badminton, Frisbee and ping-pong. We had an outstanding stay at Hacienda Sac Chic. Our group of 8 absolutely loved our relaxing stay at the hacienda. The grounds and property are extremely well maintaned and the staff was exceptional. The location is a little remote, but is an excellent point to take day trips from. Much easier than leaving from Merida centro. We are already planning our stay for next year. Hi Kurt, thanks for your feedback! So nice to hear that you and your group loved your stay at the hacienda! The Hacienda is an excellent point to take day trips and much easier than leaving from Centro Merida as you stated. Being 30 minutes outside of Merida, we are close enough to drive into the city for a day trip or night out in the town, but far enough to be 5 degrees cooler and away from all the city noise allowing guest a much more relaxing experience. We look forward to having you back with us next year! Hacienda Sac Chich was everything we'd expected and some more. We hosted our wedding there and came away with rave reviews. The compound is GORGEOUS but without being pretentious. We will always remember our swims in the well-maintained pools, our outdoor dinners by the fireflies, and our stays in the tastefully decorated bedrooms. As a bonus, the hacienda is easily accessible for those visiting from Merida and Cancun/PDC/Tulum; Cyndy and her house staff were ultra-attentive to all of our needs; and it all came at a reasonable cost. We recommend the Hacienda without reservations to anybody looking for a memorable experience in the Yucatan, and we hope to visit again sooner than later. The authentic and magical Mexico! This was my 4th visit to Hacienda Sac Chich and if I thought it was amazing before, I was blown away by it now. The owners have continued to refine this property, going to any and every length to ensure its authenticity, beauty, and comfort. Their eye for the artistic and dramatic offer a feast for the senses. I tried to snap photos for social media bragging rights, but I could never do it justice. On this particular trip we were 4 couples for a 5-night getaway and it couldn't have been more perfect. Based on the owners recommendation we had an exceptional dinner in nearby Merida, we hired a wonderful massage therapist to come to the hacienda for a few treatments, we visited nearly a cenote a day - each one more wonderful than the next, climbed the Mayan ruins, and were thrilled at our good fortune that there was a festival/rodeo/bullfight right in their little village the weekend of our visit! But mostly, we just enjoyed this magical place with our big decisions each day being which pool to dip in, which location to watch the sunset from, and what kind of margaritas we would serve at happy hour. Most people think of the beach for a Mexican vaycay. But there is nothing like the Yucatan for an authentic and truly unique experience. This review of Hacienda Sac Chich requires some history to put the property in context though, so... For almost 100 years, Merida, the capital city of the Yucatan, was the richest city in the world-- thanks to the hefty production of henequen (hemp). Wealthy Spanish families used native Mayans as slave laborers, to plant thousands of hectares (1 hectare = about 2.5 acres ) of henequen plants, harvest the leaves and then produce rope, sisal (named for the Mexican shipping port "Puerto Sisal") or "green gold" as it was later called. These hard-working plantations, demanded gigantic buildings: casas de maquinas (houses of machines) to shelter huge machines brought from Europe, as well as elaborate haciendas for the owners' weekend use. Once nylon entered the market in 1920, all of the gorgeous structures were quickly abandoned. Today they appear everywhere as heaps of rubble consumed by the jungle, unless... you happen to be Cyndy and Howard Berger, who some 13 years ago, recognized the beauty and potential of one such place: Hacienda Sac Chich. Over the past 14 years-- I have visited Sac Chich 6 times in all seasons, and every time it gets better. Every room is a work of art, with hand-made furniture and traditional woven fabrics. The beds and baths are luxuriously simple and complete. And the gardens! The palms and plants are full of birds, and lovely water features are everywhere-- including a beautiful private pool. The entire property is incredibly private within a very bustling village and a magical place for a romantic getaway, family or group gathering, or destination wedding. A wonderful Mayan family has worked for them for years, and the food is traditional, (handmade corn tortillas and salsas daily) and delicious. Or you can shop and cook on your own. There are fascinating places to explore throughout the entire area: cenotes, (deep clear and cold freshwater pools) other haciendas, (rubbled or renovated), Mayan ruins (small and large-- Uxmal is about an hour's drive), Merida-- a magnificent Colonial city, and if you really must get to a beach, you can drive to many that are much less crowded than the Mayan Riviera south of Cancun. What I and most people find though, is you really don't want to leave Hacienda Sac Chich once you arrive. I can't recommend this property highly enough. I stayed for 4 nights in the Hacienda Sac Chich with a group of women celebrating a birthday. We had the time of our lives together and because of the magic of Hacienda Sac Chich. The talented and interesting owners kept the Hacienda's original structure and walls which frame the beautifully updated dining, living, sitting, kitchen and sleeping areas of this expansive home. Prepare to be amazed and dumbstruck by the beauty and the details. There are ponds, exotic plantings, rooftop sitting areas, vaulted ceilings and thoughtful lighting throughout. The bedrooms are airy, private, and all the beds are wonderful. We slept to the sounds of water, birds, frogs, gentle breezes in the trees and bamboo each night. The pool is a gem and an oasis of refreshment when it is hot outside. I will never forget this place! This property is centrally located to many historic haciendas, cenotes and Mayan ruins. The hacienda is located in a small village of 100 people. The Hacienda is available two ways. You can rent just the Casa Vieja with the grounds,the loggia and pool, or the hacienda in its entirety. This is the economical for smaller parties who do not require the 3 extra bedrooms that are in the Casa Nueva building. The property is rented in full except the Casa Nueva building is locked. Please inquire about that rate. A 5% GRATUITY IS ADDED TO THE RENTAL FEE FOR THE HOUSEHOLD AND GARDEN STAFF.